The good news is Steam-A-Way can make short work of this task. Whether you have natural stone in your kitchen, bathroom, or some other area of your home, those stubborn stains and etch marks don’t stand a chance. Your natural stone will look very much as it did the day it was installed. At Steam-A-Way we are dedicated to helping you keep your home healthy, clean, and always looking its best. The solution to difficult natural stone, cleaning & sealing is just a phone call away. Trust Steam-A-Way for all those difficult and unpopular projects. You really will be glad you did. General cleaners not specifically formulated for natural stone or tile are never recommended. These can breakdown the sealer, thereby removing its protective properties and making the stone and tile grout susceptible to stains. Worse yet, many cleaning products, including those that contain lemon, vinegar, bleach or ammonia can etch away the polish, discolor the surface, or even scratch your stone. Many cleaners have what is called a chelating agent in them. This agent breaks down and dissolves minerals in hard water. Since all stone is made up of minerals, these types of cleaners will dissolve and cause streaks over prolonged use. Steam-A-Way offers the complete line of StoneTech Professional™ Products. Limestone is similar to marble in that it is sensitive to acids and household cleaners containing chelating agents. It varies in hardness and sometimes will have fossil imprints. Steam-A-Way offers cleaning, honing, polishing, and sealing of limestone. For best results, have your limestone sealed and use a neutral stone cleaner such as StoneTech Professional™ stone and tile cleaner available through Steam-A-Way. Marble is softer and more porous than most stone; it not only scratches easily, but also etches easily. Marble is sensitive to acids in many different food items (including citrus products, sodas, etc.) and the chelating agents in household cleaners. See the section marked maintenance for more on chelating agents. 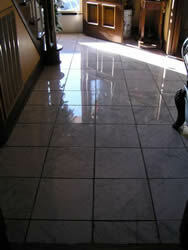 Steam-A-Way offers rust and stain removal as well as cleaning, polishing, and sealing of marble floors and countertops. For best results, have your marble sealed and use a neutral stone cleaner such as StoneTech Professional™ stone and tile cleaner available through Steam-A-Way. Travertine is limestone that has been formed by hot springs. Water movement caused erosion of the stone creating numerous holes of varying sizes. Travertine is similar to marble in that it can be polished, and is sensitive to acids and household cleaners with chelating agents. Steam-A-Way offers cleaning, honing, polishing, sealing and enhancement sealers for Travertine. For best results, have your travertine sealed and use a neutral stone cleaner such as StoneTech Professional™ stone and tile cleaner available through Steam-A-Way. Slate is a fine-grained metamorphic stone usually black, gray or green. Slate is not acid sensitive but prolonged use of household cleaners with chelating agents can cause streaking and dullness. Steam-A-Way offers slate cleaning, sealing or enhancers that bring out the deep rich natural color of slate. For best results, have your slate sealed and use a neutral stone cleaner such as StoneTech Professional™ stone and tile cleaner available through Steam-A-Way. .
Terrazzo appears more uniform than most natural stones and is available in tile form or by a pouring application on the slab. Terrazzo is a mixture of Portland cement and marble chips; these chips can range in size from a fraction of an inch to as large as several inches. Steam-A-Way offers Terrazzo cleaning, polishing and sealing. For best results, have your terrazzo sealed and use a neutral stone cleaner such as StoneTech Professional™ stone and tile cleaner available through Steam-A-Way. All Natural Stone cleaning and restoration as well as sealing jobs must be preceded by a thorough pre-inspection. Here we determine a customized care plan to meet your specific needs for your specific floor. Because your home is important to you it is important to us; we will take the necessary precautions to protect all areas surrounding your floors with 24” plastic sheets and blue tape. Stone that is etched, scuffed and scratched can be restored only by the use of mechanical abrasives underneath a rotary machine. Diamond abrasives resurface/remove a slight amount of stone (just enough to get below the etch marks and scratches). All diamond grinding is performed with the use of water to contain dust. The surfacing procedures that follow will determine the desired surface sheen. Stone is mechanically resurfaced using diamond abrasives and water to achieve a uniformly honed surface sheen. Filler within travertine stone that looks cloudy, splotchy or dirty becomes uniform with our finishing techniques. If desired, polished marble, granite, travertine or limestone can be mechanically honed to remove pre-existing surface polish. Stone is mechanically finished to produce a high gloss shine. Very light etches, scuffs and scratches may be removed with the polishing process, but diamond grinding is needed if the stone surface has medium deep etches, scuffs and scratches. Cleaning Processes vary from floor to floor, many variables include make-up, maintenance, soiling conditions, traffic, use, etc… When cleaning any stone floor we use the most scientifically advanced cleaning products and the floor is then machine or hand scrubbed and brushed. Finally the new SX-12 floor cleaning tool, connected to a truck-mounted hot water extraction system is used, achieving maximum soil removal and best overall cleaning results. We apply a clear impregnator to help protect the stone and make it easier to maintain. Depending on the stone type, an enhancer or high gloss protection can be applied.